PLEASE READ ALL INFO ON PROCESS AND AFTERCARE BEFORE BOOKING! Retinoids, glycolics, vitamin A and C serums for at least two weeks prior. Drinking alcohol, caffeine, taking iboprofen or any blood thinning medication or supplements such as fish oil at least 24 hours prior. Any treatments such as lasers, peels, waxing, botox etc., should take place 3 weeks prior. Skin should be healthy and non irritated, blemish and sunburn free for best results. If you would like your artist to use as much hair as possible, you may let your brows grow until your microblading appointment. Your artist will pluck any stray hairs that you want to remove after the mapping of your new brows. The best results come from the “Dry Healing” method. The absolute best results come from keeping your brows extremely DRY for the next 10 days! Keeping them dry makes them retain more detail, better color, and more crisp strokes. Following morning after the procedure wash your brows with distilled water and gauze pad. And that’s it for the next 10 days! You may shower or bathe normally, but avoid getting water spraying directly in your face for two weeks. 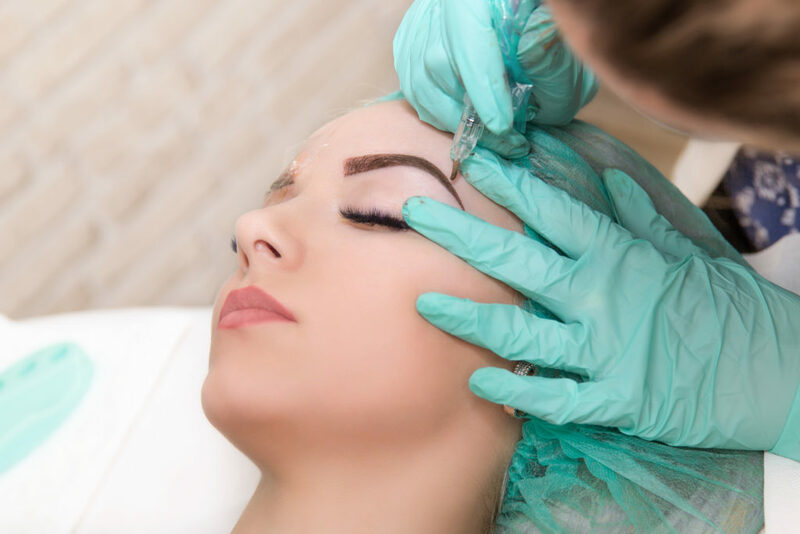 Any harsh soaps or shampoos coming into the contact with your newly microbladed brows can be detrimental to the pigment bonding process. You will want to limit the time you spend in the shower for the first 10 days. Avoid using very hot water and creating steam, the goal is not to get any unwanted moisture on the face. To wash your face use a washcloth or disposable cleansing wipe to wash AROUND the brows, making sure they stay dry. If your skin starts to feel tight and dry around day 5 post treatment, you can use a small amount of * Coconut Oil * (or a fragrance-free moisturizer, such as Cetaphil) ONLY IF NEEDED, gently moisturize the area once a day. Wash your hands thoroughly before touching tattooed area. Use a very small amount, do not over saturate the brows. DO NOT apply make-up to the tattooed area for the first 10 days. Cosmetics of any kind may interfere with the healing and color of your tattoo. NO heavy exercising or sweating for at least 10 days post procedure. If you want the best color and detail retention, this is crucial. Heavy sweating will cause the hair strokes to blur and details to be lost. Immediately following your procedure, the tattooed area will appear to be darker and bolder in color, more sharply defined or even have a more filled in appearance. This can last up to a week after the treatment while the initial healing process takes place. The treated area may feel a bit like a sunburn afterwards but there should be minimal discomfort and minimal redness. Exposure to the sun over time can cause fading and discoloration of the pigment. Once completely healed, you may apply sunscreen on the treated area. Wear large sunglasses and a hat for further protection. Rinse and dry the area throughly when in contact with chlorine. Glycolic acid, retinols, AHA’s, anti-aging lotions and serums, microdermabrasion, chemical face peels and laser treatments must be kept away from the tattooed area as continued use could lighten or discolor the pigment. Once the treated area is completely healed, any changes or additions that need to be made can be done at your follow-up appointment no sooner than 6-8 weeks later. It takes about 4 weeks for the brow area’s skin cells to completely regenerate. *2nd Appointment – “PERFECTING SESSION”- recommended 6-8 weeks later – to touch up any light spots, build additional texture, add hair strokes or tweak and perfect the shape. This session usually takes approx 1-1.5 hours.